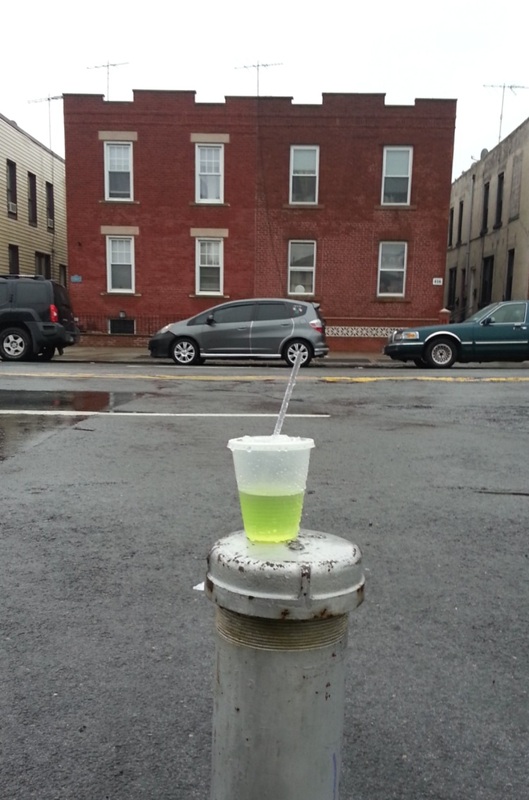 We need a dash of color on a day like this, even if it’s something that got left behind; what some might call trash. Note the antennas on the buildings across the street. The king of clubs (sometimes called Alexander the Great) is strong, has good character and loyalty, but is self-effacing. 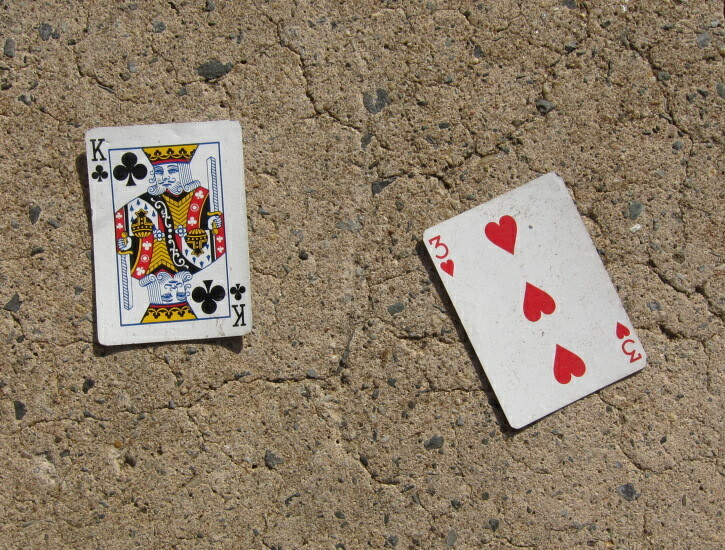 The lowly three of hearts has no special meaning; it’s just one of 52 playing cards in a deck. These two cards together don’t add up to anything special. Were the fresh mornings Sunday, Monday, and Tuesday, or maybe Monday, Wednesday, and Friday? They were tossed out of a car, so all we can assume is that those optimistic AM’s came and went. My favorite Air Freshner scent is probably Black Ice. Like Morning Fresh, it’s rather ephemeral, difficult to put into words, yet so pungent you’ll cough when you open the package. When we came upon a realistic-looking doughnut on the sidewalk, research was required. A poke with the shoe determined that it was not an Entenmann’s chocolate doughnut – the texture was spongy and the shape more oval. It wasn’t food. The Entenmann’s doughnuts have 300 calories and twenty grams of fat, so, if this were in fact the real thing, it would have more like 350 calories. Entenmann’s doughnuts look more like the sidewalk find above than these from the company’s website. The Queen of Clubs may be a face card, wedged in prominence between the kings and jacks, but it is the lowliest of the queens. It’s not correlated to any English royalty, as some of the others are, and in the French deck, the Queen of Clubs is known as Argine, and anagram of Regina (latin for queen), while her sister facecards, Athena, Judith, Rachel, are given real, not generic names. Regardless, the card was on the ground, alone and slightly trampled, waiting for me to come along and add it to my collection.